I do not know how far I believe in them…One may surely give oneself up to a line of thought, and follow it up as far as it leads…without, however, making a pact with the devil about it. A new client showed up at my office a few weeks ago. He said he was interviewing therapists. His current therapist wasn’t working out, and he was going to several others to see if they were more what he needed. I said sure. 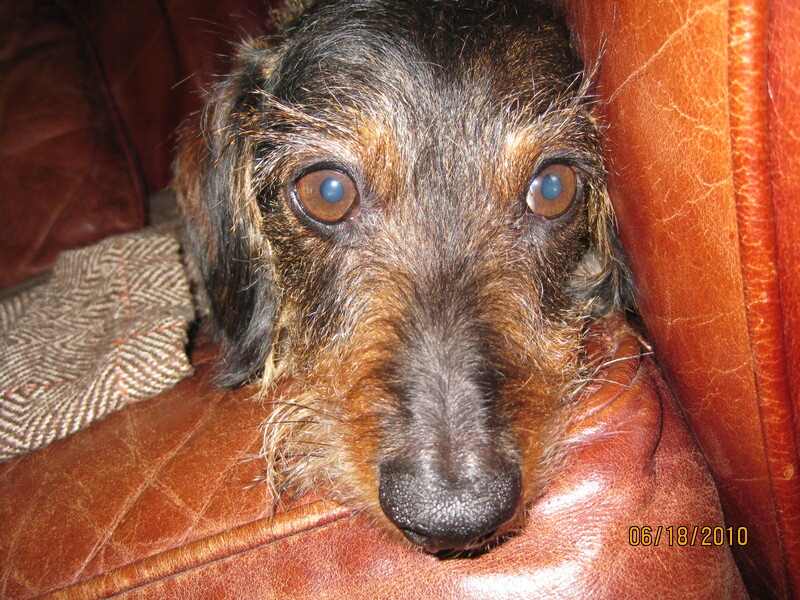 And I sat Simon, my miniature wire-haired dachshund, in my lap and scratched his ears. The patient stared at me. I stared back. It turned out this patient’s old therapist was very formal. In fact, he wore a suit and tie and enforced strict rules. Every session began the same way, with the therapist observing the patient in complete silence, waiting for him to begin. This therapist would sooner wear a polka dot dress than have a fuzzy dog in his lap. My patient admitted he found the whole set-up intimidating, like he’d been sent to the principal’s office. I suppose there’s nothing wrong with doing things with a touch of formality – we all have our personal style. The mistake is when you start to think your way of doing things is the only way. That’s when you start making a pact with the devil. Every patient needs a slightly different therapist. That’s because every patient is a slightly different person. I started out as a therapist using the couch. My patients took off their shoes, lay down, and I sat on a chair behind their heads. The idea was that they couldn’t see me, so they could free-associate without distraction. Unfortunately, I didn’t have a proper psychotherapy couch – I had a sofa, with arms. One patient was too tall. His feet had to be propped up on the arm of the sofa. It was an awkward arrangement. I was going to start on a speech about how important the couch was to free association, but I didn’t have the heart for it. Maybe the couch wasn’t all that important. One of the reasons Freud used the couch, or so it’s been said, is that he hated having his patients stare at him for hours. Maybe it made him nervous. We ended up sitting cross-legged on the floor for the final year we worked together – and we did just fine. My point is that a lot of the details don’t matter that much in psychotherapy. I know a therapist colleague who began wearing a formal suit and tie to sessions – until his patients told him to knock it off. I used to wear khakis and button-down shirts during therapy. It seemed formal enough, but not too formal. At this point I’m typically in jeans and a polo shirt. Last year I took a leap into the unknown and started wearing shorts. It was summer, and hot, and my patients were all showing up in cut-offs and flip-flops. Fair’s fair. The art in your therapist’s office doesn’t matter much either. I’ve moved paintings around and fiddled with the decor only to realize my patients never noticed or cared. If there’s anything that does matter, above all else – it is that you loosen up with a therapist, and he loosen up with you, so you can both be yourselves and explore someplace new. I’m a relaxed guy who likes to have my dog in my lap. At this point, my patients usually sit in a chair, or flop down on the couch, or occasionally sit on the floor. Whatever feels comfortable is okay with me. The greatest danger in psychotherapy is when you stop realizing that it is an on-going experiment – an improvisation – and begin believing your own dogma. That’s when you risk driving right off the rails into who knows where. There was a time during the last century when reputable therapists actually used psychotherapy to try to “cure” homosexuals. It is hard to fathom how a therapy that is all about awareness and acceptance of the authentic self could be misused in a more malicious and stupid way. But they thought they knew what they were doing and they had a lot of fancy-sounding theoretical mumbo-jumbo and books by psychoanalysts with impressive-sounding names. They had impressive degrees hanging on their walls, too. I’m sure they were very formal and “strictly Freudian” about it – although every single aspect of their work violated the essence of Freud’s thinking. A pact with the devil. Freud was an explorer. He accomplished breakthroughs in how we understand the human mind. That’s because he took risks, and was ready to admit when he’d driven up a blind alley. One of the interesting and for some, frustrating aspects of Freud is that there is no one book of his that contains all his ideas. In fact, some of the ideas in later books contradict things he says in earlier books. That’s because Freud made mistakes, and changed his mind, and never stopped exploring. For a while, he thought cocaine was a wonder drug. That didn’t last long. Many of his theories came from explorations of his own psyche – “self-analysis.” When that process worked, it was brilliant. Freud was capable of feats of honesty about himself, honesty that brought shattering insights. On the other hand, some of his ideas, like the “Oedipus Complex” probably tell us more about Freud’s family history than any generalizable theory of human nature. Sometimes you have to lose your way to find yourself someplace new. Never assume where you happen to end up is the only possible destination. And don’t make a pact with the devil. Reserve the right to change your mind. …Freud and a succession of chows, especially his Jo-Fi, were inseparable. The dog would sit quietly at the foot of the couch during the analytic hour. Far be it from me to betray strict Freudian doctrine by performing dog-less psychotherapy! Einstein…missed the chance for a Freudian explanation of why hordes of people incapable of understanding his ideas threated the quiet contemplation he craved to pursue his work by chasing after him. Are they crazy or am I? he wondered. I suspect Einstein never asked Freud why people hounded him as a celebrity because it seemed a silly and self-indulgent question. Most of Freud and Einstein’s correspondence concerned serious politics – the Nazi threat, Zionism and the like. It was also a pretty obvious question. People flocked to Einstein for the same reason they flock to any celebrity – because they want to be that celebrity. Wouldn’t it be wonderful to be Einstein – by popular acclaim, the smartest person in the world – and have everyone associate your name with the very definition of genius? Why? Because that’s what most people assume they want, until they stop and think, and maybe come up with an answer that’s a little more meaningful. Even if they do stop and think about it, they still might want wealth and fame, without realizing it – like Einstein. No one was more consciously self-effacing or less interested in money than Albert Einstein. He was constantly reminding people that he was only one of many talented physicists, including many great predecessors who laid the groundwork for his theories. He was also fiercely determined to live unostentatiously – giving much of his money away and using a good deal of it to help others, including fellow Jews who needed to be sponsored financially in order to escape Nazi persecution. Well, of course he was inviting the hunt. That’s because, while Einstein’s adult self disdained wealth and fame, his child, given the chance, drank it up. Your child craves it, too. To understand why, let’s take a look at what “rich and famous” really means. Rich means loved. Famous means paid attention to. The same things you have craved since the day you were born. Money, in psychotherapy terms, is a surrogate for security in love. A patient once told me if he won the lottery he would build a brick house that needed no maintenance and would stand for five hundred years, then he’d create a fund to guarantee that the taxes and every other possible expense would be paid for in perpetuity. He’d have a place, a safe place, forever, that no one could ever take away. He could finally feel safe and breathe free. Of course, that’s a dream. First, because you’re going to die, eventually, even if you’re hiding inside a brick house. And second, because sitting alone in a house isn’t a satisfying way to spend your life. Feeling secure boils down to more than money or a big house – it’s about feeling safe in someone’s affection, and it starts with learning to love yourself. As a child, you can gauge your parents’ investment in you – their love – by whether they are paying attention. You learn to do everything you can to keep their eyes on you as much as possible – like a kid at the playground, calling to his mother, making sure she watches each and every trick he performs on the jungle gym. Attention is like food for a young child. There’s evolutionary history behind our desire to be rich and famous. It traces back to the fact that humans, with their gigantic brains, take a long time to reach maturity. An orangutan reaches adolescence at about age four. He’s in contact with his mother’s skin almost without break for much of that time, then soon becomes independent. A human doesn’t reach adolescence until thirteen. He requires more than a decade of childcare – too many years to rely solely on the care of parents. The human child senses instinctively that his life might depend upon summoning care and attention from others. No wonder you work hard to become rich and famous. The problem with chasing wealth and fame is that it’s a child’s mission, not an adult’s. At some point you must step out of childhood – that long, helpless period of your life – and move onto the independence of maturity. Instead of needing reassurance that you are loved, you can achieve independence by learning to love yourself. That big step into adulthood is an affirmation that you deserve love, and deserve to receive it from those you call friends or partners. You needn’t crave attention as an adult, either. It feels nice, now and then, to receive praise for your work. But if you have your own attention – you’ve done the job of living consciously as your best self and winning your own respect – you no longer have to cry for mommy to watch you perform on the jungle gym. You can learn to feel safe and secure in your own abilities and achievements. Security within yourself is worth more than being rich and famous. The ultimate goal is security in the knowledge that you have friends who deserve you and care about you, meaningful work that you enjoy and a partner who is a true friend and ally. That beats wealth and fame any day. It’s interesting that one of the most famous photos of Albert Einstein features him sticking his tongue out. You’ve probably seen it a million times on postcards or posters on dorm room walls. It seems to speak volumes about Einstein’s naturalness and lack of pretension – his being in touch with his child. Perhaps that’s true. It was photos like that – and his crazy hairdo – that helped make Einstein an icon of approachable, lovable brilliance. After overhearing a doctor say that the hospital was short of private rooms, Einstein insisted he was “getting much better” and asked to be moved to the ward. That way, his room could go to someone who needed it more. He was talked out of it when told he would be more trouble in the ward. Helen Dukas [his private secretary] came to collect him a few days later, and they left by the back entrance through a gauntlet of reporters, newsreel cameramen, and almost the entire hospital staff, who were there to wish him well. On the way home, pestered by photographers, he was snapped by one of them, sticking his tongue out at him. The original, un-cropped version of the photo gives a slightly different impression from the familiar cropped version. The original includes the people around Einstein, who are trying to hurry a sick man home through a crowd of reporters. Perhaps, when he stuck out his tongue, Einstein the adult was simply annoyed and exasperated at a mob harassing an aging, unwell physicist whose work none of them could even understand. On the other hand, maybe Einstein’s child was having a bit of fun and enjoying the attention. Probably both were true. Einstein might not have been certain himself of exactly how he was feeling at that moment, or why. But however much he unconsciously basked in the glow of wealth and fame – or fled from it – the father of relativity devoted the majority of his later life to ignoring his wealth and avoiding attention while working hard to achieve nuclear disarmament and world peace. Being rich and famous wasn’t enough. Einstein the adult needed a more meaningful dream.